MCPH Health Promotion Specialist Katie Smith and Health Promotion Manager Mary Cornforth Cawood attended the 27th Annual Art & Science of Health Promotion Conference in Colorado Springs last week. The conference focused on improving awareness of the benefits of healthy lifestyle, enhancing motivation to form and maintain positive habits, building the skills necessary to perform new behaviors and creating opportunities that make the healthy choice the easiest choice. Katie is pictured here with wellness coordinators, coaches, educators and entrepreneurs, that attended the Wellness Culture Coach certification training. She is the fifth person from the right in the second row. MCPH team member Katie Panega talks with Lincoln Orchard Mesa Elementary School students about healthy eating habits on April 4 in celebration of National Public Health Week. MCPH team members, from left, Katie Panega, Mary Cornforth Cawood, Karen Melott and Katie Smith presented to Lincoln Orchard Mesa Elementary School students about healthy eating habits on Tuesday. Team members Troy Ward, Katie Goddeyne and Jess Feilmeier also pitched in, but aren't pictured. Mesa County Elections Director Amanda Polson (left) and Elections Coordinator Jesse Redmond adjudicate ballots. Mesa County Elections Director Amanda Polson pulls reports for the municipal election. Mesa County Clerk and Recorder Sheila Reiner (right) and Elections Technician Karen Reiher duplicate damaged ballots Tuesday night. Elections Manager Patti Inscho tabulates votes on the evening of Election Day. Mesa County Clerk and Recorder Sheila Reiner and staff along with election judges open ballot envelopes on the night of April 4. City of Grand Junction Clerk Stephanie Tuin (left) and Mesa Clerk Sheila Reiner perform the final Logic and Accuracy (L&A) Test close to 11 p.m. on Tuesday night for the municipal election. The election is the City of Grand Junction's largest ballot turnout (41 percent) since 2011. 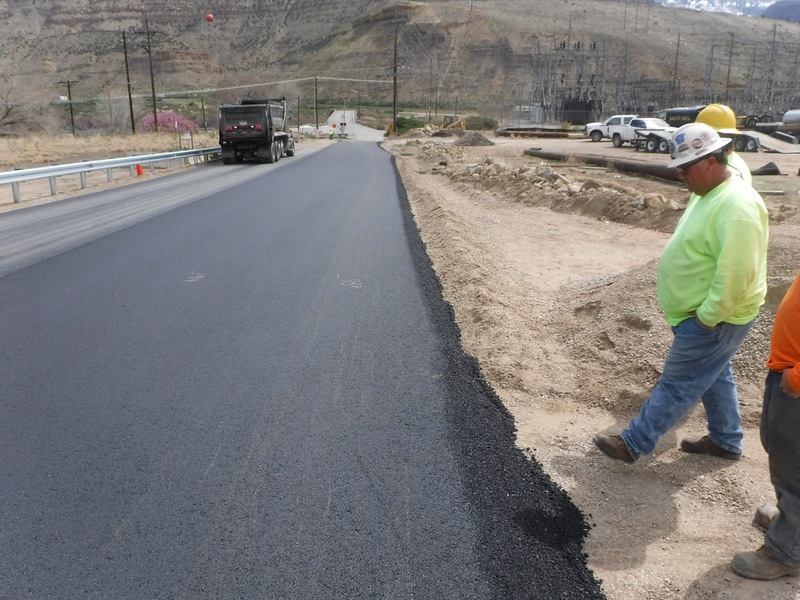 16 Road, northwest of Fruita, is being prepped to be paved next week, on Tuesday, April 11, as part of the Mesa County MM-16-N.3 and MM-16-O.5 Bridge Replacement project. The project is scheduled to be completed by the end of May 2017. The Cameo Bridge was paved on Wednesday! The Mesa County Cameo Bridge Replacement project consists of replacing the existing bridge spanning the Government Highline Canal located on I.9 Road from the I-70 off ramp. Last year, Mesa County was awarded $832, 248.20 in federal funds for the replacement of the Cameo Bridge. The old Cameo Bridge that was replaced was built in 1960. The Cameo Bridge is located on I.9 Road to the west of the former Cameo Plant. I.9 Road also provides access to the Little Book Cliff's Wild Horse Area, which is eight miles northeast of Grand Junction. The Mesa County Cameo Bridge Replacement project is scheduled to be completed by the end of April 2017. Buckskin Hill, a portion of 58 ½ Road extending south from Highway 330 in Collbran, has experienced some significant sliding and settlement. The worst of the settlement has been addressed in the first phase of the Buckskin Hill project. Buckskin Hill Phase II is a design-build project with the goal to address two unstable areas as well as drainage issues. Construction crew members add anchoring soil nails on Wednesday, adding structural stability to the hillside. 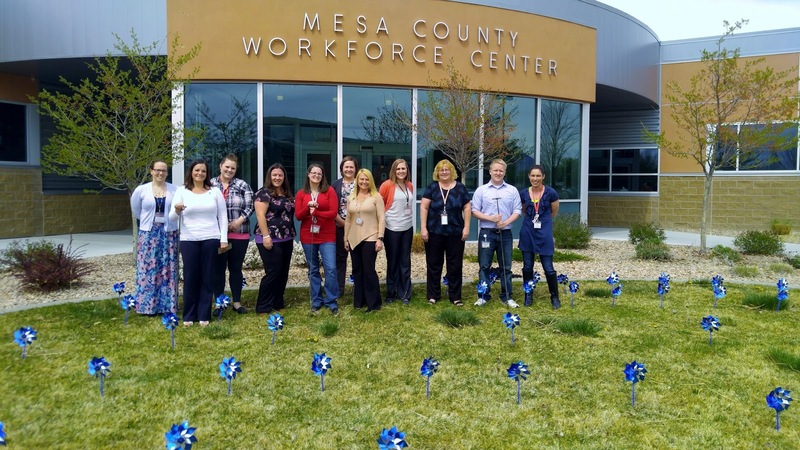 Staff participates in the annual pinwheel planting in front of DHS and WFC in recognition of National Child Abuse & Neglect Awareness Month. It takes a team effort to keep children safe and to plant pinwheels! Child Welfare Supervisors Kari Daggett & Sarah St Martin plant pinwheels in front of the Community Services Building, 510 29 1/2 Road. Child Welfare staff plant pinwheels in front of the Workforce Center, 512 29 1/2 Road, to spread awareness of Child Abuse Prevention month. 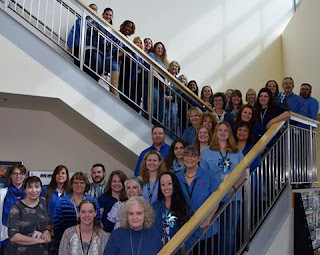 DHS & WFC staff wear blue in observance of National Child Abuse & Neglect Awareness Month. Call (970) 242-1211 to report abuse or neglect in Mesa County. Rio Blanco Commissioner Shawn Bolton and Mesa County Commissioner Rose Pugliese talk about opportunities for economic growth in western Colorado. From left to right, Rio Blanco Commissioner Shawn Bolton, Micheal H, and Mesa County Commissioner Rose Pugliese. Mesa County Commissioner John Justman (left) and Rio Blanco Commissioner Shawn Bolton talk about the passage of House Bill 1152, concerning the authority of a federal mineral lease district to manage a portion of the direct distribution of money from the local government mineral impact fund to counties for the benefit of affected areas. Mesa County Public Works Engineering Regulatory Programs Manager Carrie Gudorf talks to residents about the details of the Bosley Wash Detention Pond project, which will be built on the north side of I-70, just north of Clifton at 34 Road. 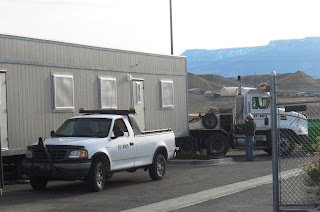 On Thursday, contractors began laying the concrete slab for the temporary tent where animals will be housed while the Mesa County Animal Services building gets repaired. Contractors spread the concrete for the slab. Contractors cut stress points for the new concrete slab at the Mesa County Animal Services campus, 971A Coffman Road. The temporary office for the Mesa County Animal Services staff was delivered on Thursday. Animal Services' supplies will be stored temporarily in a storage trailer through the completion of the repairs to the facility.